K&N is one of the most recognized names in performance air filters, and air induction systems. They got their stellar reputation by applying scientific research to the field of automotive filtration. This state of the art approach is applied to their air filters, air induction kits and oil filters, rendering a product that can move an extremely high volume of air and fluid, while significantly reducing contaminants. This increased flow allows an engine to produce much more horsepower and torque (i.e. better throttle response). And the best part is, most K&N products can be quickly installed using common hand tools! K&N OE replacement air filters are actually handmade in the United States and the United Kingdom. Only premium materials are used, which allows them to be both washable and reusable. Independent Laboratory tests have proven that a K&N air filter can be washed and re-oiled over a hundred times, yet it will still perform to the original specifications. K&N high performance air intake kits offer a significant increase in horsepower, thanks to their use of an oversized open element air filter. The larger filter surface increases the airflow, and keeps even more dirt from entering the engine. Plus, these large air filters can go for 100,000 miles before they have to be cleaned and re-oiled (the smaller K&N OE replacement air filter can go for 50,000 miles before it needs a cleaning). K&N air intake tubes are made of either molded high-density polyethylene, powder-coated aluminum, or anodized. These materials allow for less air turbulence inside the tube, which results in more ponies for your right foot to play with. And of course, all K&N air filters come with that famous Million-Mile Warranty. But to get this warranty, you have to buy from an Authorized K&N Dealer. Lucky for you, we are an Authorized K&N Dealer. So if you buy that new K&N filter here, you’ll get a Factory Warranty, along with Factory-Direct prices. 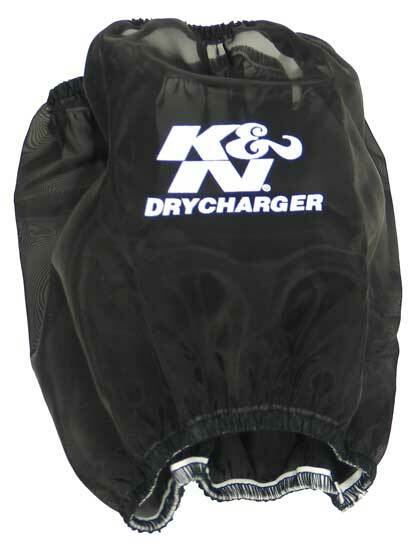 While this K&N Drycharger Air Filter Wrap might fit your vehicle, unfortunately we can't guarantee fitment. Please read description and specifications to decide if this part is right for your vehicle.